You are here: Home / Hunting / Muzzleloader Accuracy: Are Six Inch Groups Good Enough for You? Last time I was at the shooting range, the fellow in the lane beside me was also shooting a muzzleloader. It is a rare occurrence for me to see another muzzleloader at the range, but it was even rarer because we were both shooting Thompson Center (TC) Encore rifles. Our rifles had the same barrels and breech plugs, but his had a beautiful walnut stock and I added the new synthetic Pro Hunter Flex Tech stock to my gun. When I first started shooting a muzzleloader, I didn’t have anyone I could trust to ask for help or answer questions, so I spent the first year following bad advice from salesmen at sporting goods stores and other shooters at the range. Needless to say, I did not shoot well. My shooting improved after I finally got some good advice. I am always looking for people I can learn from and get more good advice. Since this fellow had more gray in his beard than I have in mine, I was hoping to pick his brain a little and learn something new about shooting modern muzzleloaders. I noticed he was shooting PowerBelt bullets (245 grain Aero Tip). Since I was never able to shoot good groups with PowerBelts with my TC, I was curious to see how his gun would shoot them, especially since our barrels were exactly the same. I was skeptical that his rife would shoot them any better than mine could and when he continued to shoot without cleaning between shots, my expectations decreased. Later while I was cleaning, he noticed my EZ Tip Primer Extractor (click here if you need one) and said he needed to get one. He admitted he would be more likely to clean the barrel if he didn’t have to remove the forearm and extractor first. If I had an extra, I would have sold it to him. Since I take the time and clean my barrel after every other shot (clean barrel shots at one target and dirty barrel 2nd shots at a 2nd target), I only shot four times by the time he had shot 10 or 12 times. He had already checked his target once. By the time I had shot six times and was ready to check and replace my targets the first time, he had checked his target twice. We walked out to check our targets together, and when he saw his last group, he said “six inch spread from a muzzleloader isn’t too bad at 100 yards”, as if he had achieved the level of accuracy he wanted. I don’t know how many shots were in his last group, but to me, his group appeared to spread six inches left and six inches right for a 12 inches spread, not a six inch spread. And yes, six inch groups from a modern muzzleloader is bad, especially from modern Thompson Center, Knight or CVA muzzleloaders. If six inch groups at 100 yards were the best you could do at the range, would you shoot at a deer or elk in the field at that same distance? Personally, if that were the case, I would never feel comfortable unless I had a shot at 50 yards or less. I was shooting Barnes 250 grain T-EZ bullets and the group from my clean barrel shots was just under two inches and surprisingly, the group from the 2nd shot dirty barrel was better at just under one inch. 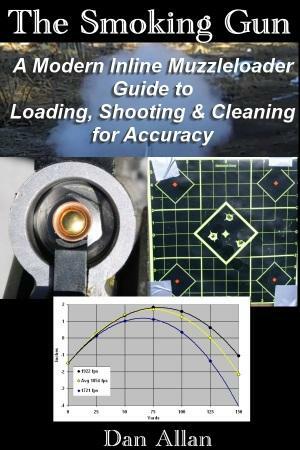 It’s not that I am a great marksman, it’s because I have taken the time to find a bullet and powder combination that my muzzleloader shoots accurately and I stick to a strict cleaning protocol when working up a load or sighting in the rifle. He looked at both of my shot groups and responded by saying he hoped he could make the PowerBelts shoot better because he had spent a lot of money and couldn’t afford not to use them. I mentioned that six inch groups were the best I could do with PowerBelts with my TC and joked that I couldn’t afford to throw mine away either, so now I use them for fishing sinkers. I expected to get a laugh, but none came. 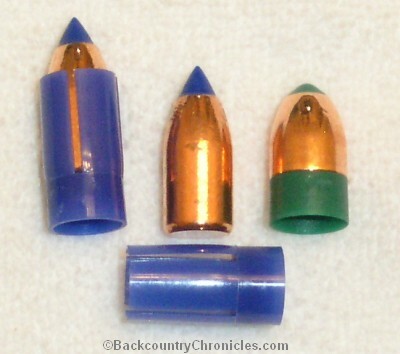 On the way back to the shooting line, he said he should try the Barnes bullets, so when we got back to our benches, I gave him three of the Barnes 250 grain T-EZ bullets. He thanked me, but said he was done for the day, but would shoot them next time. I was disappointed I wasn’t going to get to see the results then and there, but hope for both his sake and for the sake of any buck he takes a shot at this season that he does. My TC Impact was the same with powerbelts no matter what load I tried. I switched to Harvester green Crush rib sabots with 240 gr. .429 Hornady XTRa. With Pyrodex RS, they weren’t much better. Since I got the gun used and it has a dark spot (pitting) about 6″ from the breech. I thought I was screwed. Then I tried 80 grains of FFFG black powder and got cloverleaf groups at 50 yards and under 1 1/2″ at 100! Time to quit playing and go hunting! My loading regimen is to start the bullet with a short starter, then finish in one smooth push with the rod. One featured alcohol wipe and one dry patch between shots. Might be overkill, but small groups are worth the effort. I purchased a flintlock, they recommend f4 granulars (FFFF black powder) for the pan flash. What can you use instead of f4? Since I can not find f4 where i live. You will have to buy black powder online and have it shipped to you. Be advised you will pay a hazardous materials fee, so you may want to buy in larger cans. Stores like Cabela’s and Bass Pro Shops used to sell and ship it, but now seems only substitute powders are available for shipping. You can buy FFF I& FFFF black powder in bulk online at Powderinc.com. It is expensive, but shipping (to my address) is free.